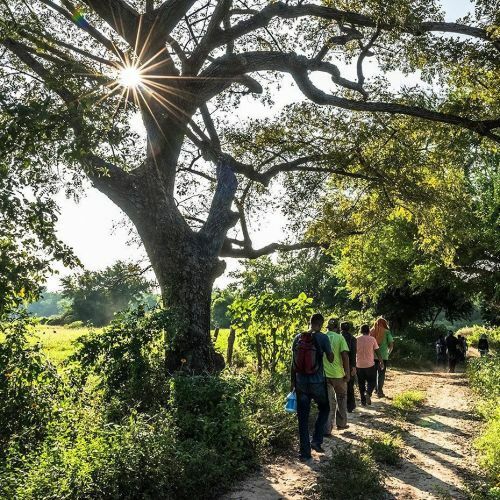 "For 2 days in November, @nytimes journalists followed 10 men — 6 Hondurans and 4 Guatemalans — as they trekked more than 40 miles through dense forests, sun-bleached farmland and highways patrolled by the authorities in Mexico's Chiapas State. A new reality on Mexico's southern border has arrived: Mexican authorities are cracking down on the tens of thousands of Central Americans who have been heading north. Their enhanced vigilance, the result pressure from the U.S., has forced migrants to abandon safer modes of travel like the once-preferred trains and buses. Now, migrants must take riskier routes through remote stretches of the Mexican countryside, which is crawling with gangs, frustrated villagers and corrupt police officers. @danielberehulak photographed this group walking along a backroad to avoid checkpoints between Arriaga and Chahuites. Only 2 of the 10 men made it to the U.S." By nytimes on Instagram.